PRI Executive Director Shaker A. Mousa has been chosen to serve as Guest Editor of a special issue of the journal Biomedicines that will be focused on Anti-Angiogenesis Therapeutics in Cancer. strategies in Oncology. It is aimed to cover preclinical and clinical steps involved in the discovery and development of anti-angiogenesis targets in cancer and to discuss mechanisms involved in the modulation of angiogenesis in relation to cancer therapy. FDA approved anti-angiogenesis agents in cancer therapeutics and limitations will be reviewed. Furthermore, the implications of Nanotechnology in expanding the utility of existing and new novel anti-angiogenesis strategies in cancer will also be reviewed. The deadline for manuscript submissions is March 30, 2017. 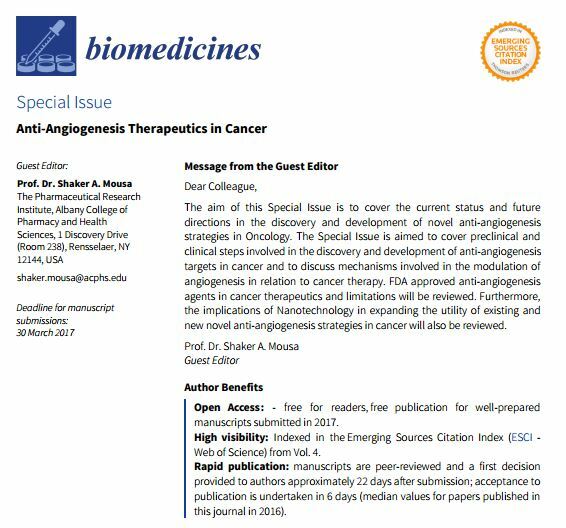 For more information about the Special Issue on Anti-Angiogenesis Therapeutics in Cancer click here. For more information about the journal Biomedicines, click here.